Our family really loves hiking in Marin during the winter, especially when there's a waterfall involved. One of Marin's favorite family hikes is at Cascade Canyon Open Space Preserve near Fairfax. The trail here winds through Elliott Nature Preserve, along San Anselmo Creek, to the 20-foot Cascade Falls. It's particularly popular during the winter and spring when the creek is flowing, but it's a great place for a fun family hike at any time of year. This easy out-and-back hike is about 1.5 miles round trip. Start out at the trailhead on Cascade Drive in Fairfax and head onto Cascade Fire Road. San Anselmo Creek burbles along to your left, and you'll find a couple good flat spots for the kids to walk down and explore the creek. Ordinarily you'll follow Cascade Fire Road for approximately a half mile until it meets with Cascade Falls Trail, fording shallow parts of the creek in a couple spots. After a period of heavy rain, however, San Anselmo Creek can be deep and fast-running, making crossing it hazardous. If the creek is too deep, take the appropriately named High Water Trail that parallels the fire road to the right. It's narrower and has some steep sections and drop-offs, so if you're hiking here with little ones keep an eye on them and proceed cautiously. The trail takes you deep into the forest, which is cool, quiet, and lush with ferns (and wildflowers in the spring). Cross the little wooden footbridge at the confluence of San Anselmo and Cascade Creeks, just after the trail turns to the left, and then turn right onto Cascade Falls Trail. It's a short hike uphill alongside Cascade Creek to the waterfall. It's a little steep in places but steps on the trail, as well as wooden railings and viewing platforms, help make the climb easier. To get back to the trailhead, turn around and go back the way you came. There a plenty of other trails in the preserve to explore, too. 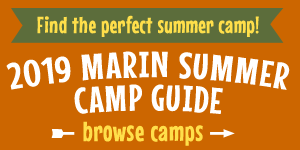 Learn more about Cascade Canyon, download a free printable trail map, and explore an online field guide to the preserve at www.marinparks.org. Cascade Canyon Open Space Preserve is located just west of Fairfax at the end of Cascade Drive. To get there, take Sir Francis Drake Boulevard to Fairfax and turn left into downtown Fairfax and onto Bolinas Avenue. Follow Bolinas Avenue until you see Cascade Drive, where you'll turn right. The trailhead is at the end of the road. Parking here can be really difficult, especially on a busy weekend. Limited parking spaces are available along the road. Make sure you pay attention to the parking signs, as there are several "no parking" sections and areas where your car must be parked completely off the road. If parking on Cascade Drive is too difficult, there's a second trailhead close by at the end of Canyon Road, which is right off Cascade Drive. If you park here, follow the short Canyon Trail until it meets up with Cascade Fire Road. As with most Marin County Open Space areas, amenities are extremely limited. No restrooms or drinking water are available. Pack your own water and snacks, and dress in layers as the temperature can drop when you get into the shaded forest area. On-leash dogs are welcome. The trail can get pretty muddy during the rainy season, and with a creek to cross in several spots wearing rain boots is a good idea for kids. Cell phone service is pretty much nonexistent here, too.